In 1989, PT Ciputra Surya Tbk was become the pioneer of 'Kota Mandiri' development in West Surabaya. The first company project is Surabaya Citra Raya Real Estate that opened in 1993. This real estate is resides in an area about 1126 hectares and become the development project of the biggest Real Estate in East Java. This real estate is known as The Singapore of Surabaya which is refer to the cleanness, modern and green town like Singapore has. This luxuriant housing is built with inwrought security and safety system. Power cable tissue system, telephone and polarization of water stay underground. This is what makes Citra Raya housing as one of the best in Indonesia, especially Surabaya. There are various attempts have been made to realize this Citra Raya, starting with bringing Singapore's icon to the city, adding greenery, improve the quality of infrastructure, and also management of the city. 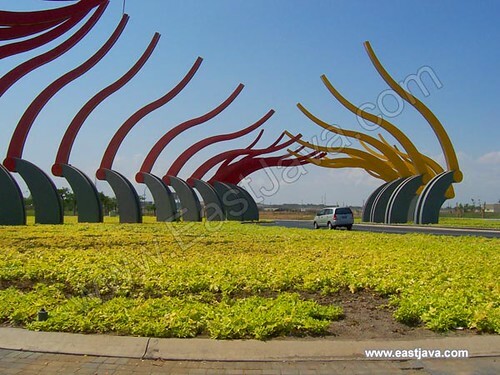 Citra Raya has many amenities, such as 27 holes in the golf course and family club, Surabaya International School, Ciputra School, Gymnasium, commercial centers, markets, houses of worship, Ciputra University and Waterpark. Due to very large-scale development, Citra Raya has chosen the consumer for middle class and upper class as a target market. Citra Raya products offered varies from home with the size of the building / land area of 77/135 square meters to 368/450 square meters; the big scale of the house is for the upscale customers. The housing area is managed inwrought by an institute. Once in a while we meet busy women to abstract grass weed, sprinkle crop by using sprayer and water faucet being attached alongside the road. They are worker woman that is visible contrast with "moderation" and a luxuriant housing image.